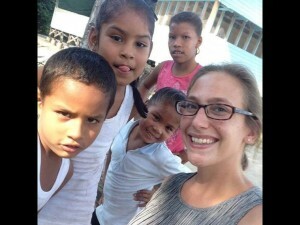 Mead, Nebraska, native Emily Garcia with some of her students in the village of Malali, Guyana, in South America. The Peace Corps worker has one more year of service in the village, where she teaches reading and other fundamentals to 35 students ranging in age from preschool to preteen. Every day for the past year, Emily Garcia has grabbed a basket of laundry and walked a short distance to the nearby river, where she not only washes her clothes but also bathes. It’s the rainy season in Malali, Guyana, so the river current is fast. When she finishes, she walks back to her apartment — which does not have electricity — hangs her wet clothing and prepares for her day working with the Peace Corps. Garcia, a native of Mead, Nebraska, lives and works in the small South American village located near the Demerara River. A graduate of Doane College, she is a community education promoter and teaches reading and other fundamentals to the village’s children. She works with 35 students who range from preschool age to preteen. The lives the children of Malali lead are very different from those of the children Garcia previously worked with as a student teacher in Omaha. She said simple things American kids may take for granted like new books or watching a movie are considered luxuries to her Guyanese students. Garcia is one of a handful of teachers in Malali. Because of the village’s isolation — the nearest urban community is Linden, Guyana, which is two hours away and accessible only by boat — just a few of the teachers, including Garcia, are trained in education instruction. The village’s population is predominately female, as most of the men are away for weeks to months at a time working as lumberers or miners in the rain forest. The women who remain are left to care for the children, households and the community as a whole. For some, that includes teaching other villagers’ kids, even if they haven’t been trained to teach. Because of this, most of the children do not receive any reading instruction for several years, and, Garcia said, Guyana’s literacy rate is low. Only half of her students will go on to some kind of secondary education once they have completed sixth grade. The boys are more likely to enter the village’s workforce while the girls are allowed to continue with their schooling if their families can afford to send them to Linden to the nearest secondary school. Some girls, however, become housekeepers and caregivers at young ages. Garcia said she is getting used to the Malali way of life and its “simplicity.” No electricity means no refrigeration, which means most of Garcia’s meals are flour-based foods, such as pancakes. Other foods are rice and canned vegetables and meats such as tuna or Vienna sausage. The women in the village cook, clean and raise children, but every day the villagers gather to talk, relax or play. She is able to shop for food and supplies about once a month. And while there is a health care worker who lives down the river, the nearest hospital is also in Linden. Garcia said suffering an injury is one of the risks of her job. Not being able to communicate easily is difficult for Garcia’s mother, Toni Roberts of Mead. Garcia can call or email her mother only when she is in Linden. Robert said she was scared once when they agreed Emily would call and didn’t. Though Garcia was fine — her trip to Linden had been delayed — Roberts said she had to use Facebook to find out through the families of other volunteers in Guyana that her daughter was safe. She and other parents of Peace Corps volunteers use social media to reach out to and support each other. Garcia still has another year of service in Malali. She is looking at other options that will allow her to teach abroad.